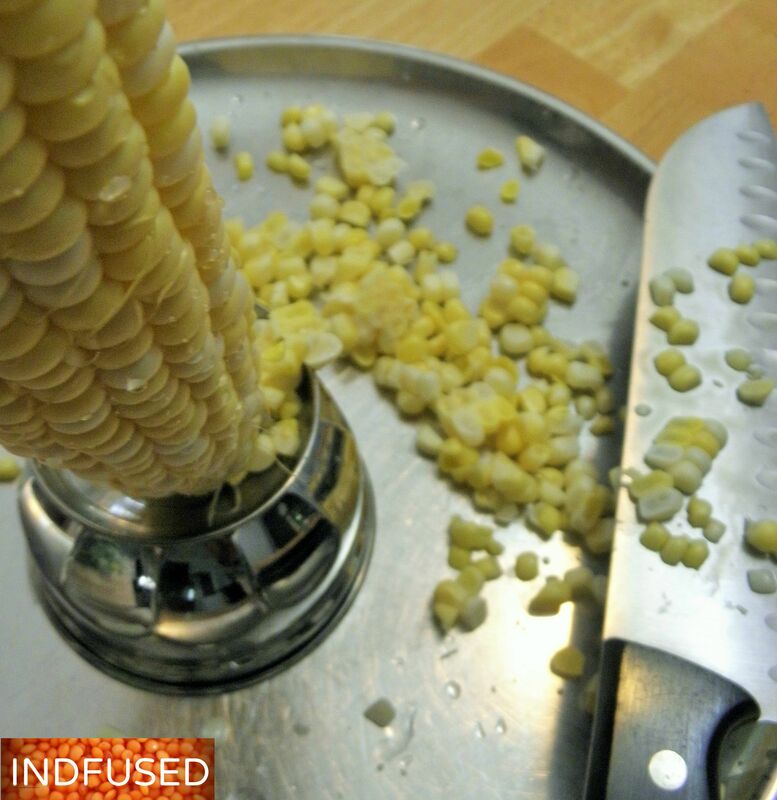 To cut the corn kernels off the cob, simply invert a bowl over a plate. I used a stainless ice cream bowl which has a little pedestal that is hollow on the bottom. That made it even easier to hold the corn on the cob in place. With a knife I cut off the corn kernels and then ran the dull edge of the knife over the cob again to catch the milk from this ‘end of the summer’ corn, that is bursting with flavor. Add the tempering, chopped veggies, cilantro and coconut and you have a fresh koshimbir or salad in no time flat! Heat the ghee or coconut oil in a small pan over medium heat. Add the mustard seeds. When they start to sputter, add the diced serrano pepper and the asafetida. Let it sizzle for about 30 seconds and remove from heat. Set aside to cool. This is the tempering. 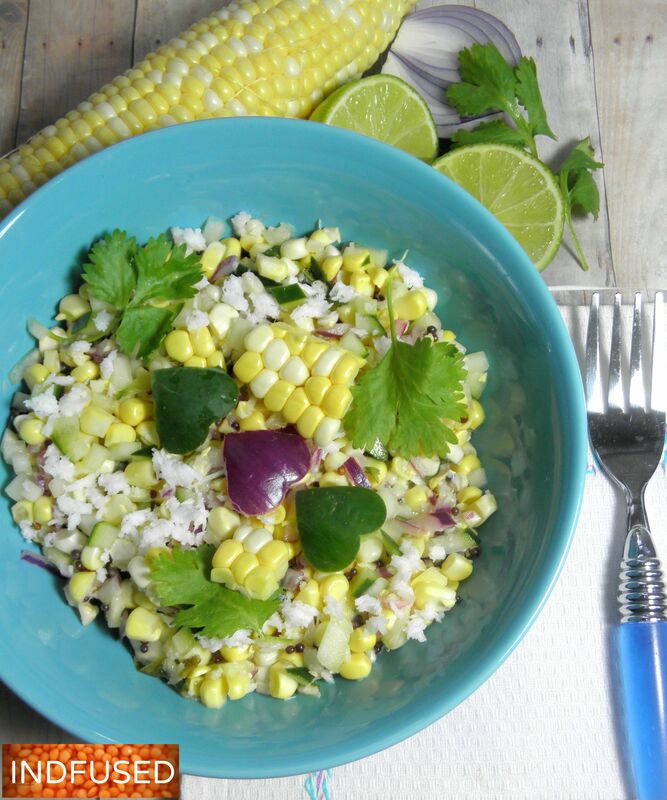 Meanwhile combine the corn kernels and its milk with the diced cucumber, red onion, grated coconut, chopped cilantro, sea salt and the lime juice. Add the tempering and toss well to combine. Thanks Ronit! It does taste amazing together! Sandhya that is a beautiful salad, the presentation is just gorgeous and it’s fresh and delicious and perfectly seasonal. Thank you Suzanne! I cannot resist the ‘end of summer’ corn that is bursting with flavor. This looks so delicious Sandhya! I love your presentation….just gorgeous! Lovely recipe .. but I will try with boiled corn. Thanks Shobha. I make boiled corn raitas that I love too but was bowled over by raw corn. I did not expect to like it so much. We get very tender bi color sweet corn in the Boston area this time of the year. That looks great. I have to confess I’ve never tried raw corn! Will do now. Emily, I was not sure about it at first too but now I am hooked! Sandhya, this looks lovely. I have never tried this combination of flavors but will definitely try this out. Thanks for sharing. I love Koshimbir. Thanks for sharing. Thanks Ana! Asafetida is used in a lot of temperings in vegetarian cooking and is a typical ingredient in the koshimbir temperings. Let me know how you like it! Have a great weekend! Thank you so much my sweet friend!It has been so hot, right? 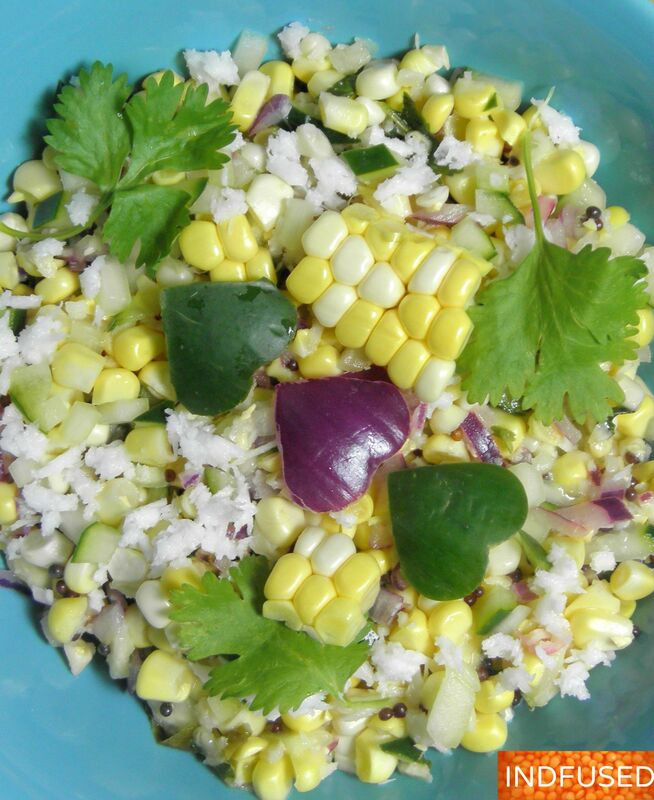 I am thinking of all the cool foods:) I recently discovered raw corn salad and I am hooked! The bi-color corn that is flooding the markets now are just so super sweet and hard to resist. Corn & Coconut are two most loved items of my parents..Love the idea of combining both. Look at the prple snd green hearts. Such lovely posts you take the time to prepare and present to us, like gifts. Thank you! Thank you so much Robin for appreciating the posts.Your writing is a very precious gift to so many of us too. Robin, I like this corn dish and your idea to have it as a side dish for Thanksgiving is fabulous!